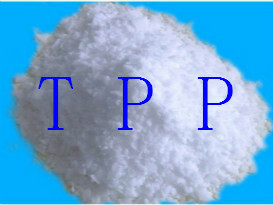 Triphenyl Phosphate TPP production process - ZhangJia Gang YaRui Chemical Co., Ltd.
（1）Thermal method Dissolve the phenol in pyridine and anhydrous benzene solvent, slowly add phosphorus oxychloride under no more than 10 ℃, and then react for 3-4h at reflux humidity, after cooling to room temperature, water scrubbing the reactant to recover pyridine. Dehydrate it by dry sodium sulfate, and filter out the sodium sulfate, recover the benzene by distillation under atmospheric pressure; carry out reduced pressure distillation to collect the 243-245 ℃ / 1.47KPa distillate, and finished products will be obtained after cooling, crystallizing, and crushing. ( 2 ） Cold method Dissolve the phenol in pyridine and anhydrous benzene solvent, and then drop phosphorous trichloride to form the Flame retardant TPP at 40 ℃, continue to add chlorine to generate phenyl phosphorodichloridate at 70 ℃, and hydrolyze to form Triphenyl Phosphate TPP at 80 ℃. Water scrubbing, alkalis neutralize and condensate the hydrolyzate, finished products will be obtained after vacuum distillation. Purification methods: it often contains phenol, phosphoric acid, phenyl acid phosphate and other impurities. Recrystallize and refine it by ethanol or the mixture of ethanol and solvent gasoline. These are the production process details of Triphenyl Phosphate TPP, and if you want to learn more information, please contact us! If Triphenyl Phosphate TPP production process product is not what you want, we can be customized according to your needs, please send us your order to Email: sales@yaruichem.com , or click here to post your buying lead.